Every Saturday from 11am-1pm at our North End Campus! Connect with Harrison for more information at harrison@churchoftherock.ca. Join us for the kick off! 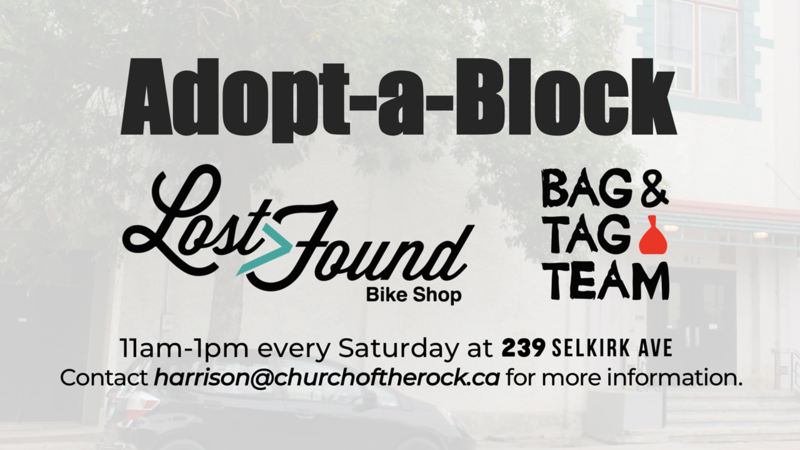 We will be staring our Bag & Tag and Lost Then Found Bike Shop outside on May 12 at our Church of the Rock North End Campus (239 Selkirk Ave)! Bag & Tag is our team of volunteers who serve by cleaning up the streets of our community and ministering to those in our community! Lost Then Found Bike Shop is our team of volunteers who serve those in our community by helping fix up bikes and talking to those stopping by! Come join us to love and serve those in our community!